We have recently been working on a bathroom remodel project and have become enamored with encaustic tiles we have seen. Encaustic tiles have been around since medieval times when they were made with two or more colors of clay inlaid together to create a pattern which is beautiful, colorful, and timeless. According to Tile-Magazine.com “this art form reached its peak in the mid-1800’s when Minton’s Ltd. began to supply them for walls and floors in churches, public buildings, and grand palaces.” Nowadays, these tiles are made with cement rather than clay. Yet, the process remains basically the same – instead of being painted with a pattern, the color and pattern in encaustic tiles are literally baked in. 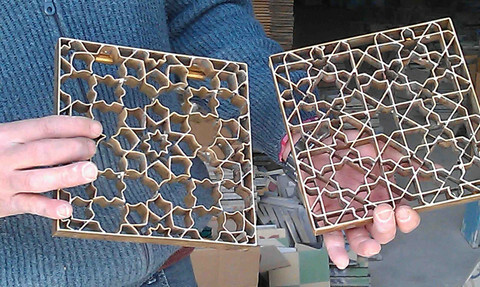 Each tile is made by hand using a special frame resembling an intricate cookie-cutter. Layers of pigmented cement are then poured into the various sections of the mold. We love the extra flourish these aesthetically pleasing tiles can add to any space. Whether they are used for a kitchen backsplash, an entry way, or a bathroom floor, encaustic tiles are a great way to show off your personality and style. Our design advice, though, is to make sure that the style of your house works with the pattern you love. There are so many patterns to choose from – graphic and contemporary styles, Moroccan-inspired patterns, and traditional Victorian to name just a few. While authentic handmade encaustic tiles can be very expensive, there are many glazed porcelain and ceramic tiles that mimic the look yet are much more modestly priced. We will post a new blog when the bathroom is complete – look for the encaustic tile in the post. Kitchen backsplash in Kyra II Terrazzo from www.cementtileshop.com - this handmade tile is priced at $8.60 for each 8” square. Revival Memory 8” square tiles by Merola can be found at Home Depot for $1.98 each.